The Netherlands sets the best example, but don't copy anything just because it is "Dutch"
While Germany is a genuine leader in renewable energy, and Danish design is known across the world, it is the Netherlands that should be looked to as the leader in cycling. infrastructure is a moving target. Observers from other countries with a far lower level of cycling often express an interest in Denmark or Germany because they are considered to offer a more "achievable" or "realistic" target to aim for. A cheaper solution is sometimes seen as an easier thing to emulate than the Dutch solution. It's true that those nations spend less, however they also achieve less. While the Netherlands continues to grow cycling from an already higher base (in 2011 the population cycled nearly 10% more than in 2010), Denmark is struggling against a long term decline in cycling and Germany has infrastructure which is unpopular with many of its cyclists. Are those good scenarios to aspire to ? middle of the road. They're gone now. is now much more pleasant. Let's not even consider the absurdity of looking towards places which have achieved even less than Denmark and Germany, be they vocal cities in the UK or USA or elsewhere. What works for a minority cycling modal share and what works in a limited area with a demographic bubble are not necessarily what works for true majority cycling over an entire nation. It makes no sense to campaign for something which isn't actually good enough. Campaigners should be inspired by the best of Dutch infrastructure and be wary of distraction by things which don't have a proven record of success. 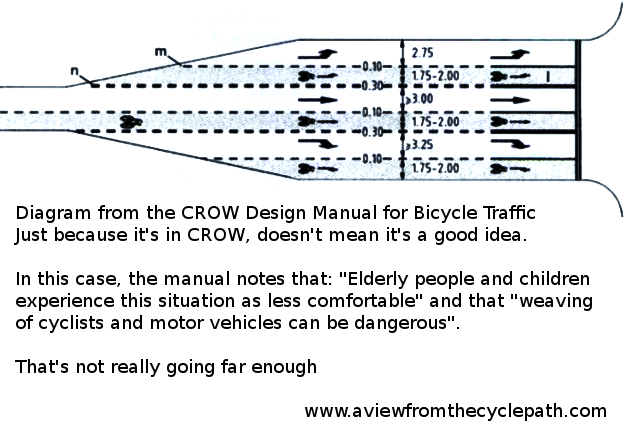 The CROW Design Manual for Bicycle Traffic manual is as good a manual for cycling infrastructure design as exists. However it's not perfect. The manual tells you how to do a great many things, but it does say so much about which solutions are good solutions. For example, it rather glosses over the serious safety problems caused by "mixing lanes", and the section on them doesn't suggest much better solutions for similar junctions. 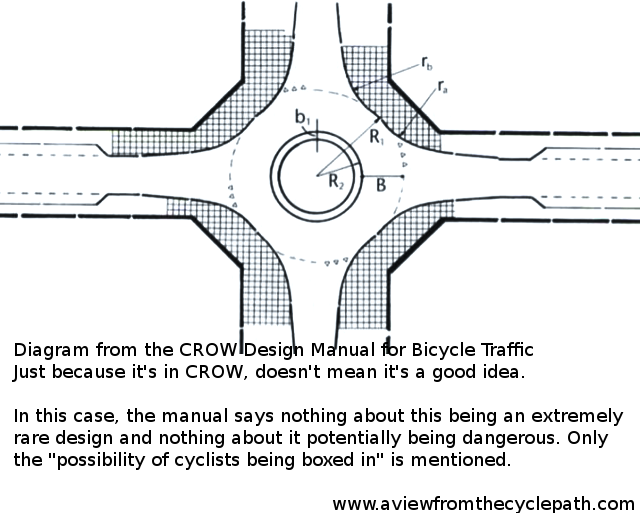 The CROW manual can be used to justify many things which you would not expect a modern Dutch road layout to include. Unfortunately there sometimes seems to be a lack of "quality control" when people are inspired by what they see in other places, including what they see in the Netherlands. Not everything "Dutch" is equally good and equally worth emulating. Sometimes there are apparent "solutions" which seem easier to copy and these get too much attention. This isn't helped by the Dutch themselves occasionally forgetting about why they cycle and placing far too much emphasis on things which are less important or by their giving a lot of press to new ideas which are unproven or which in some cases simply don't work. What's Dutch and should be ignored ? where you don't have to stop at all. Traffic lights which give cyclists priority when it rains have been in the news recently. This sounds lovely of course until you give it a little more thought. The article states that "The rain sensor did not lead to significantly longer waiting times for the non-cycling travellers, nor did it produce jams or stagnation". Now if the change in cycle timing benefits cyclists but does not cause a problem for other road users, then why do we not have that new timing all the time instead of only when it rains ? It's illogical in the extreme to do this, and as it costs an extra €10000 per traffic light, why bother when the same benefit can be found by reprogramming the lights permanently ? This is a gimmick which sounds good in a press-release but is otherwise quite silly. Another recent idea was heated cycle-paths. Again this initially sounds like a fine idea, until you realise that it is simply not practical. This idea is estimated to cost between €20K and €40K per km. 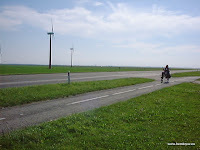 However, the Netherlands has 35000 km of cycle-paths so it would cost a thousand billion euros to implement everywhere. Clearly this cannot ever happen. At best a very small percentage may be heated, perhaps outside the town hall, and the traditional way of clearing paths (which is already very successful) will have to continue anyway. What's more, the increased cost of maintenance and the energy required to warm the paths has not been accounted for. This is another gimmick which sounds good in a press-release but doesn't really translate into much on the ground. for 80 years. Read about the inventor. A third example in recent months is the idea of roads which glow in the dark. This "designer" nonsense even won "Best Future Concept at the Dutch Design Awards". The resulting press-release was taken up by organisations around the world and it received a considerable amount of coverage. Did no-one think about how impractical this is ? It's really a daft idea. Dutch roads genuinely do have a problem with how visible they are after dark, but spreading a thin layer of rapidly worn away paint across the entire surface is not the way to deal with this. British roads have provided an example of a better solution for nearly 80 years ! Cat's Eyes are retroreflective devices found in vast numbers along Britain's roads and motorways. The very clever design of Cat's Eyes means that they retract to avoid damage so are resistant to being driven over by trucks and even snow-ploughs, and that they use this retraction to clean themselves. What's more, they've a proven history of success. Having driven on both Dutch and British roads and motorways after dark, I can state that it is quite unequivocally easier to do so in the UK because you can see so much better where you're going if the centre-line and sides of the road are fitted with Cats Eyes. Often there is an over-emphasis on the most recently built exceptional pieces of infrastructure. To claim in a press-release that you will build the "longest", "tallest", "widest" or whatever of anything is of course a real crowd-pleaser. It guarantees free publicity even before the new thing exists. Cities which have built exceptional pieces of infrastructure often use them to hype themselves. I have received email from Dutch architects and "creative engineers" asking for me to advertise for them by writing posts about their latest projects on this blog and I've been invited to events and other such things. However I am not interested in astro-turfing for such companies and you should be wary of reading articles which are the result of marketing campaigns. Until something has been finished, proven to work and has a long record of being cost-effective, it's not ready to be copied elsewhere. Campaigners need to be wary of all of this. Publicity is not our aim. Cycling is our aim. Exceptional pieces of infrastructure can only ever make up a small percentage of the total and if given too much emphasis they distract attention from the important point that it is the very high standard of the infrastructure which goes everywhere and which everyone uses every-day for all their journeys which creates a high level of subjective safety and attracts people to cycling. Fancy bridges, tunnels or claims for the "longest" cycle-paths or whatever are nice to see and occasionally convenient to use, but they're icing on the cake, not the cake itself. I've occasionally covered exceptional pieces of infrastructure on this blog, but with warnings. There is also the perennial favourite of "Shared Space" road layouts. Despite having failed as a concept here in the Netherlands, there being no new large "Shared Space" projects, these ideas keep being pushed with enthusiasm elsewhere, quite often by those who stand to gain from contracts for its implementation. Even here in the Netherlands they sometimes achieve design wins, even though we know that shared space is not really safe. These days, with an increase in interest in Dutch cycling infrastructure elsewhere, "Shared Space" is sometimes pushed on the grounds that it's "Dutch" and therefore must be good. However, in practice this is now barely a Dutch idea at all. While a Dutch invention and while such layouts had brief popularity here in the early 2000s, the problems with this "emperor's new clothes" manner of redesigning streets are now quite clear and few people would ask for this. Far fewer than 1% of the street layouts in the Netherlands are "Shared Space" and as a result they form just a few weak links in an otherwise very good network of infrastructure for cycling. The real way of civilizing city centre streets is to remove most of the cars from them. 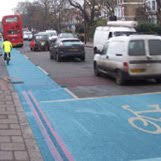 Compare a video of a street which was once shared space but is more pleasant now that motor vehicles have been removed with another showing how shared space is both dangerous and inconvenient for the vulnerable. scooters to cross safely here ? Turbo Roundabouts are a Dutch innovation to keep motor vehicles moving. They're horrible for cyclists, causing danger and inconvenience and cyclists are never expected to use the road on a turbo-roundaout. 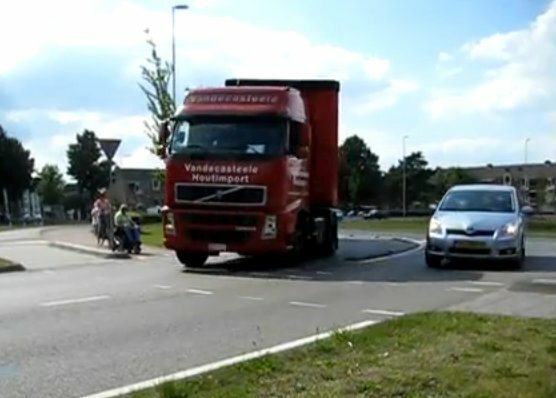 Protests about infrastructure are rare in the Netherlands, but there have been protests against Turbo Roundabouts because even crossings at such roundabouts are not necessarily safe. While Turbo Roundabouts are bad news for cyclists, the design of some other Dutch roundabouts is exceptional. However here also it is necessary to pick the best, safest, most convenient examples to copy and when copying them, it's essential to copy the entire thing. I've seen several examples of engineers from other countries trying to pick some aspects of Dutch roundabout design but miss out others. It's common for people to focus on the geometry. i.e. they see the difference in exit radii and the size of the island in the centre but miss out the cycle-paths. So far as cyclists are concerned, the cycle-paths are the fundamental reason why Dutch roundabout design works well. Miss them out and you do not have a "Dutch" roundabout. While on the subject of large junctions, traffic light junctions in the Netherlands are not all created equal either. The best design of traffic light junction for cyclists is the simultaneous green design. This is not only extremely convenient but also has proven to be extremely safe and it fits almost any size of junction. Anything else compromises at least one of safety or convenience. 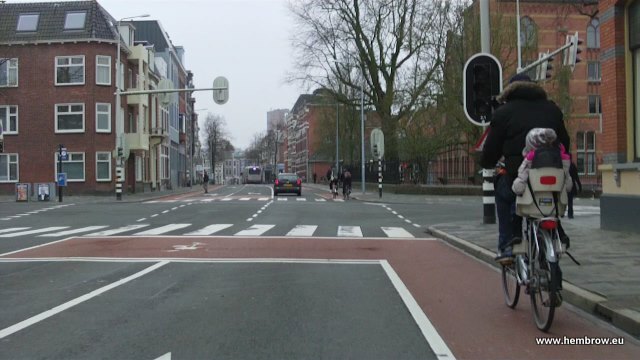 Unfortunately, much discussion elsewhere is concentrated on the "Standard Dutch Junction" or the "Protected Intersection", both of which are versions of older and less successful designs. What's Dutch and often misunderstood ? Lower speed limits are a good thing. The Dutch think so - and that's why more than a third of the total road network in the Netherlands has a 30 km/h or lower speed limit. However, research published in the Netherlands four years ago showed that merely lowering the speed limit was not nearly enough of an intervention to make roads safe. Residential areas and villages should have speeds no higher than 30 km/h / 20 mph on their streets. However, even where there is such a low speed limit it is often necessary still to have separate cycling infrastructure, and low speed limits certainly don't remove the need for separate cycling infrastructure in other places. Achieving safety requires removing cars or building separate infrastructure for bikes and of course junction design is important too. It is worthwhile to campaign for lower default speed limits but lower speed limits should be viewed as just one of a number of tools to civilize the streets and their contribution should not be over-emphasized. The same goes for Strict Liability, the importance of which is often much over-stated in other countries and which is often misrepresented as meaning that drivers are taken to be responsible for all crashes which occur between bikes and cars. In fact, strict liability was introduced after the Netherlands already had an extensive cycling network and it is this network which makes cycling popular, pleasant and safe. Separating cyclists from motor vehicles as much as possible, building a dense network of cycling routes and making cycling routes shorter and more convenient than driving routes are all more important than either lower speed limits or strict liability. Separating bikes from cars has a much greater effect on subjective and actual safety than does changing the laws which apply to drivers. Unravelling of routes so that cyclists do not have to travel parallel with motorists can make it possible to segregate modes without specific cycling infrastructure. However, the resultant routes for cyclists should be the direct routes, not indirect routes which go "around the houses" in order that cyclists are merely kept out of the way of motorists. developments in the 1970s and 1980s. Woonerven (or "living streets" - similarly, the living-room in a Dutch house is called a woonkamer) are residential streets in which people take precedence over motor vehicles. The concept was especially popular in the Netherlands in the 1970s and 1980s. While woonerven provide for access by any means of transport, they should not be through routes by motor vehicle. What's more, they should also not be through routes by bicycle. 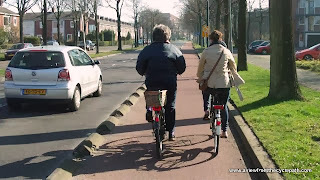 Woonerven are not cycling facilities, they are intended to be pleasant places to live. This is not enhanced by having nose to tail commuters heading through these streets either in cars or on bikes. If someone suggests that a woonerf should be a through route for bicycles, look out. Not only have they fundamentally misunderstood the concept of a woonerf, but they're probably proposing to send cyclists "around the houses" rather than provide the direct routes that cyclists need. 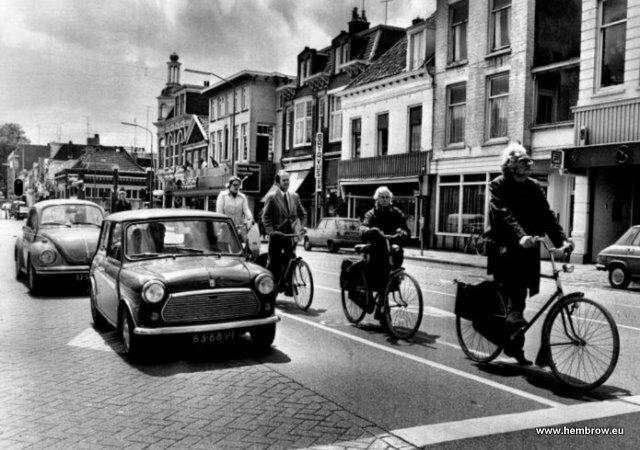 From many peoples' interpretations of what the Dutch have done, you could come to the conclusion that many things are "anti-car" in this country, but it's not true. The Netherlands is a rich western nation in which people can easily afford to own cars if they want to, and this country does not make it difficult to own, drive or park the cars that people own. New-build residential areas provide ample car parking so that ownership of cars doesn't cause problems for other residents. Many shops offer free parking. The city that we live in, Assen, has the cheapest car parking in the Netherlands. What's more, the roads are well maintained and well sign-posted. They're a pleasure to drive on. That driving can be very convenient for some purposes, and that people like to own cars does not stop those same people from cycling if cycling is an attractive option. But for this effect to become reality, cycling must be a very attractive option people for people from all walks of life. There is nothing unique about the Dutch people which makes them ride bikes - they find it useful to do so because it has been made into an easy choice to make and that comes because the environment encourages cycling. The Dutch have successfully harnessed the enormous pent up enthusiasm for cycling that exists everywhere. The desirability of cycling results in people using their bikes even though commutes by car are subsidized by the Dutch government. The first pedestrianized street in the world was built in Rotterdam in the Netherlands and there are now many pedestrianized zones across the country. However, unlike pedestrianized zones elsewhere which ban cycling these are usually easy to access by bicycle. However, note that these are generally not main bicycle routes. A main route through a shopping street could cause conflict. Similarly, shared use pedestrian/bicycle paths are not built because they also cause conflict. For the same reason, bus lanes are not combined with bicycle lanes. that you do need to go to Germany. Be wary of "holiday opinions". Holidays in other countries are not remotely like living there for a period of years and they often lead to people having a view of their holiday destination which doesn't fit reality. To understand another country you have to live there for years and put some effort into understanding how things are in your new home. Note that Dutch commentators speaking about the Netherlands are equally unlikely to understand differences between their country and others unless they have lived for many years in other countries and spent the time to study those differences while they were there. The significance of the everyday and mundane things which are taken for granted by cyclists in the Netherlands can easily be forgotten. Dutch commentators are as likely as those from elsewhere to place an over-emphasis on the new and spectacular, particularly if this shows their country in a positive light. Also note that most Dutch people have no real understanding of the problems facing cyclists in other countries because they have not experienced them. After he read comments about "dooring" in youtube comments, I had to explain carefully to one Dutch bicycle blogger what this meant because despite cycling since he was a child he had never experienced it himself. There can also be problems with language, and that's not just restricted to bloggers. Even the Fietsberaad sometimes publishes documents in English which don't mean the same as their Dutch equivalents. Dutch people have told me that the Netherlands suffers from all sorts of problems, such as particularly high unemployment, a high violent crime rate, a terrible problem with litter, mass obesity, particularly terrible economic problems. They also often think that mopeds are a huge problem for cyclists, though they're actually a non-issue in most circumstances. If you're close to even a small problem it can seem like a big problem. I've also been told that cycling is far more pleasant in the UK because of a supposedly more extensive British network of traffic free paths, which of course doesn't actually exist. The hyped initial promises for London's "superhighways" resulted in some Dutch media sources suggesting that the Netherlands could soon fall behind, which of course didn't happen. Why do people believe these things ? Without the perspective of seeing how other people live by living as they live it's difficult to be objective. Cycle-chic style pictures and videos of peak time cycling (I made them myself way back in the days before youtube had HD) look nice but do not really teach us anything. When emphasis is on the young and pretty then the impression is given that they are the cycling demographic we should aim for. When wider demographics are featured they tell you nothing about why it is that older or younger people cycle or about how often they are seen doing so. Videos of masses of people cycling are of no real use without an explanation of why. The result is often to simply reinforce the irrational beliefs about Dutch cycling that many people already hold, and this can be read in the comments. Not all things proposed as "Dutch" in other countries are actually Dutch at all. 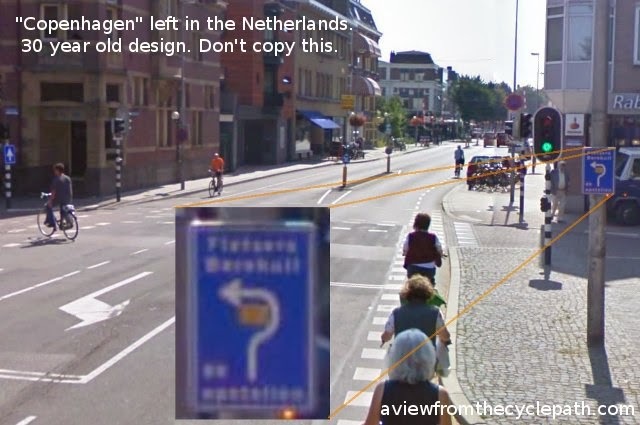 Two stage turns are an example of an inferior junction design of a type no longer built in the Netherlands, linked with fatalities in Copenhagen, yet copied as a "good" example of "Dutch" design in the UK. These were built up to about 30 years ago in the Netherlands, but I've not seen one of these for more than ten years. A reader sent the location of the junction in the photo on the right. There's a reason why these went out of fashion - it's because they're unsafe and inconvenient. While junctions like this might have been "Dutch" in the past, it seems a bit unfair to still blame the Dutch for them now when almost all have been replaced. Solar panels are a wonderful technology. They are a reliable source of clean energy which should be adopted more widely. I believe in solar energy enough that I put my money where why mouth is and installed solar panels on our own home. However note what this "belief" is based upon. I didn't do this just because of a fanciful idea that this was "green" but only after I had done all the maths and worked out that panels in this location would generate enough electricity that they would definitely pay back both economically and environmentally. In the UK we lived in a house where the roof faced the wrong way. I did the maths then and worked out that we couldn't expect a reliably positive return from solar panels on our roof because it faced in the wrong way. As a result, when we went house hunting for our current home we looked only at houses with south facing roofs specifically so that we could install solar panels and have them pay their install cost back. Bad locations make no sense at all with solar panels. Due to the cost (both environmental and monetary) of the panels, it makes absolutely no sense at all to install them in locations where they cannot work. Doing so is not in any way good for the environment, but actually negative because the environmental cost of producing and installing the panels will never be earned back during the life-span of the panels. 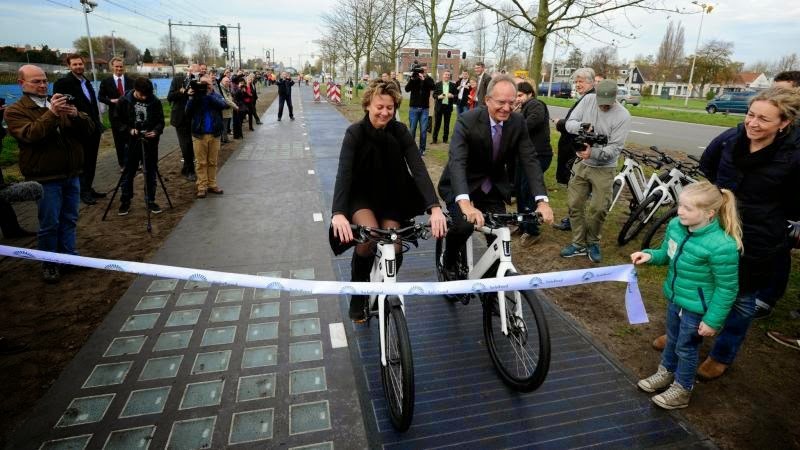 A cycle-path with solar panels in it has recently been opened in Krommenie near Amsterdam. This has been receiving a lot of press due to a vast campaign of hype. This is a completely ludicrous idea. Solar panels are a marginal technology. They are only economically and environmentally viable when mounted facing the sun, in a place where there is no shade at all and where they won't be damaged so will have a long life allowing them to continue operating for their payback period. South facing (Northern Hemisphere) roofs are an excellent place for solar panels. A location underneath a road, with extra levels of glass above, not sloped to face the sun, with shade from trees, cyclists, leaves, grime etc. and at risk of damage from weather effects as well as snow-ploughs and other vehicles is anything other than an ideal location. Dust is a problem even for solar panels on a roof. absolutely absurd idea. Do not copy it. positive outcome from solar power. It is impossible for solar panels placed under a road to ever pay back their cost of installation. 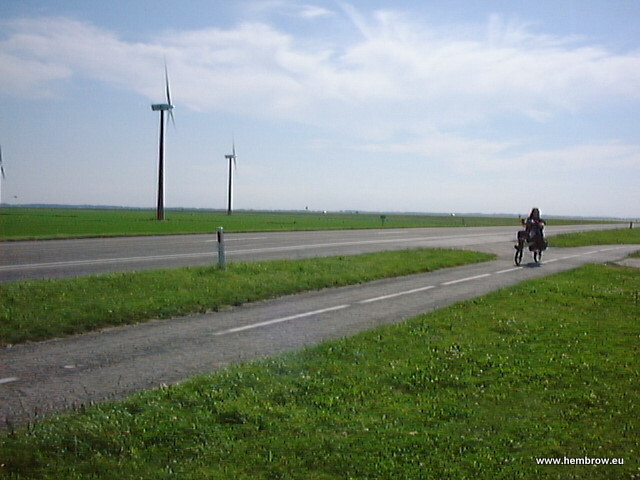 The total environmental cost of building this "solaroad" will be higher than simply using asphalt on the cycle-path. It will certainly be higher than using asphalt on the cycle-path and placing the same solar panels in a more useful location. Please try to ignore the hype. I'm sure the company who is pushing this idea will try very hard to sell it, but they are trading on people not being able to do the figures themselves and work out why this is a bad idea. The Dutch minister who opened the cycle-path is clearly confused. He has said that his "dream for the far future" is to be able to ride in cars driven by the power provided by the solar panels embedded in the roads along which they are driven. But he clearly does not understand the issues as his dream makes absolutely no sense at all. With any given solar panel technology you can always generate more electricity at a lower cost by putting the panels next to the road than by putting them under it and you're unlikely ever to get a positive return from panels in roads. Note that no theoretical new technology can help this to make sense. There are limits to the efficiency of solar cells which current technology already approaches. Maximum output from any cell design is related to how much light hits the panels and starting by reducing the amount of light which hits the cells by burying them under a road is simply a ludicrous thing to do. These things could only be made to compete with solar panels placed in more sensible places by making the sun shine brighter, and even if that were possible it would still make more sense to put the panels next to the cycle-path rather than under it. I started working out the numbers for SolaRoad, but someone else has beaten me to it and done a good job of explaining: click here for a brash, long but also very illuminating video which explains the figures. What's the harm in doing something else ? What's the harm with making a slow start ? The problem with following the wrong path is that time is wasted while this happens. The suggestion that campaigners should work towards something other than what the Dutch have has been made since at least the 1970s. Surely forty years of trying things that don't actually work for furthering cycling is enough. It's time to stop falling behind and catch up as quickly as possible. The Netherlands is ahead in cycling mainly because other countries have never really been in the race. It's much easier to make an excuse about the Dutch being 20 / 30 / 40 years ahead and therefore difficult to catch up with than it is to make genuine political and financial commitments which will last for decades, but that is what is required in order to make a proper start at catching up. No more broken promises. copy this, there are better examples. Not all of the best ideas in all fields come from the Netherlands. Not all Dutch ideas are good. Not all Dutch people know why they cycle. Not all Dutch people how lucky they are to be able to cycle as they do, and of course not all the infrastructure in the Netherlands is perfect, nor was it all built recently to current standards and nor was everything built recently built to good standards. In short, the Netherlands is far from perfect. However, if you're interested in improving cycling in your own country this is still the most successful nation by a considerable margin and therefore is also the single best place to look for inspiration. The problem is finding the genuinely good examples from which to be inspired rather than picking examples at random. Never aim low because by doing so you guarantee not to achieve a high cycling modal share, but how can you be sure that you're aiming for the best ? the hedge on the right of the picture. something to ask for elsewhere. Campaigners with low aspirations for their own countries often seem to cling to inferior infrastructure in the Netherlands because they view it as "more achievable". However you have to see this in context. Examples of low quality infrastructure in the Netherlands are merely weaker points in a comprehensive network which is of high overall quality. The remaining examples of lesser infrastructure have typically survived where they are because in these locations they cause relatively few problems. However, infrastructure is constantly being upgraded (and occasionally downgraded) all across the country. This inferior infrastructure is under threat even where it works. If you refer to such infrastructure to form your standards, you run the risk of setting the standard for your best infrastructure to be equivalent to what has already been removed in the Netherlands. What was shown not to work well enough here will then be installed in places where it won't work well in your own country and having set a low standard you will be doomed always to achieve a lower cycling modal share than the Netherlands until the standard can be changed once again. If it's already taken forty years to set a standard, you need to get it right. oldest cycle-path and will be upgraded. There is no need to learn from the past mistakes of the Netherlands by repeating them. You can leapfrog over them and copy what really works. Do make use of the best examples. Make sure you ignore the less good examples. The worst thing for campaigners to do is to hamper their own efforts by not setting a high enough standard for themselves and for the community that they live in. If you were planning a mission to the moon, would you go to NASA for advice, or would you prefer to take notice of what the Ugandan space programme had achieved on the grounds that it looks more affordable than NASA ? We run regular study tours, both on dates which are open to anyone who wants to book individually as well as special tours for interested groups. We take just three days to demonstrate and explain how cycling works in the Netherlands. Take advantage of our decades of experience of living, working and cycling in both the UK and the Netherlands.